Lionel Armfield (Service No 1309), was born in Burra Burra, S.A., in June 1887. At enlistment, in Kiama, N.S.W., he was single, 27 years old, worked as a labourer and listed a friend, in Victoria, as his next of kin. Lionel embarked on HMAT A48 Seang Bee, with 3rd Battalion, 2nd Reinforcement, on 11th February 1915. 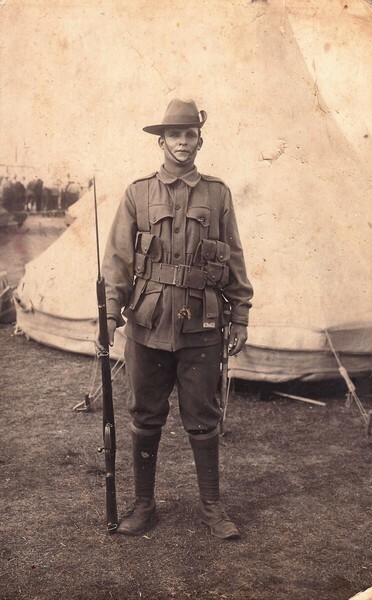 He arrived in Egypt, and was sent to Gallipoli, Turkey, with 3rd Battalion, on 25th April. Lionel survived the early fighting, but was killed in action, at Quinns Post, during the Turkish attack of 19th May. Lionel is buried in 4th Battalion Parade Ground Cemetery, Row E, Grave 2. A letter on file from his next of kin indicates he wanted the medals and personal effects to go to blood relatives. He advised there was a stepfather, who Lionel had fallen out with, but that was the only information . His medals are still unclaimed. He is commemorated on the Kiama Memorial Arch.